Put Jesus at the center of your Christmas! Many people step into the Christmas season run down and worn out. And by the time January rolls around, they’re so exhausted that they’ve completely missed the real reason for the season. But there’s really no better time to recalibrate your heart toward Jesus than during the holidays. 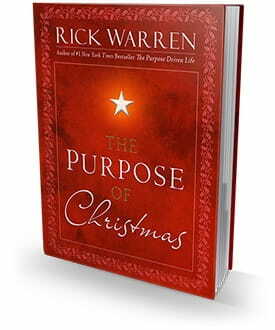 And Pastor Rick Warren’s book, The Purpose of Christmas, can help you fill your Christmas with more of God’s love and peace by making Christ the center of your life. This resource shows you . . . The Purpose of Christmas is our way to thank you for your gift below to help more people learn, love, and live the Word – so request your copy when you give! From all of us at Daily Hope, may you experience God’s peace and joy this holiday season! Originally published November 23, 2017.